oz (30 grams) Bloodroot Paste! Active Ingredients; Bloodroot, Galangal Root, Chaparral Root and Zinc Chloride! This paste has been long known to remove unwanted skin tags, moles, warts, boils, and other skin anomolies. 100% Guaranteed to work great or your money back!! 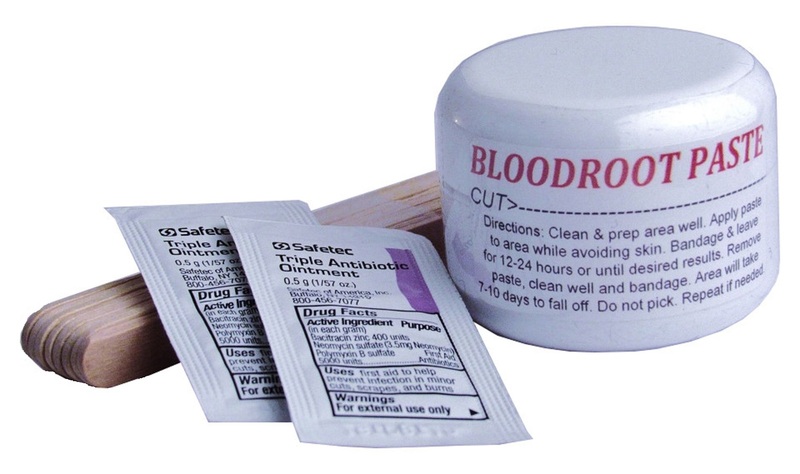 Included with paste; applicators and vitamin A&D Ointment. Normal Price; $59.95, Limited Time Offer; ONLY $39.95!! WARNING: Keep out of the reach of children! Pregnant women or women who are breast feeding should not use. If side effects occur contact a physician immediately. (Not a treatment for any cancer). *Not FDA approved for medical treatment. This product has not been FDA approved to treat, heal, or cure any illness, disease, or dysfunction. Shipping; Same Day Shipping! Items will be shipped same day if ordered before 2PM est. USPS 1st Class shipping. Typical US shipment time 1-4 days.